Today the weather was rain all day until mid afternoon as forcast. I was due to lead the ride to Stedham so I headed up to the Cross to see if anybody turned up. Sensibly nobody did so after waiting 5 minutes I headed back taking a different route on backroads via Colworth. 17 miles for the day. 14 May 2006. Chichester Cross start for ride to The Putting Green Cafe, Arundel. Harvey, Avril, Jo, Tony and myself met at Chichester Cross on a cool & overcast day. We set off east through Westhampnett, Halnaker, Eartham & Slindon, and then climbed up Whiteways hill via Madehurst. We stopped at the refreshment hut there for elevenses. As always the car park there was teeming with motorcycles of every description. After a while we made a fast and rather chilly descent into Arundel, arriving at the Putting Green Cafe a mere 20 minutes after setting out from Whiteways. We met up with Mike & Richard inside the cafe (it was a bit too chilly to sit outside) who had cycled straight there from their respective homes. After a pleasant hour or so we departed, travelling along back roads through Binsted & Walberton to Aldingbourne, where the rest of the group had afternoon tea. However I travelled straight home at this point. My mileage at the end of the day was 103km. I was the only one to join Colin for the ride to Lodsworth but we later met up with Tom at Amberley Station. Weather was generally overcast with a few sunny spells in the afternoon and temperatures cooler than of late at about 16C. From Amberley the 3 of us took lanes via Bury to stop for tea at Bignor Roman Palace. Then more lanes via Sutton, Burton Mill Pond and Selham to Lodsworth. After lunch Tom decided to make his own way back. Colin and I returned at a brisk pace on scenic back roads via River and Petworth to stop for Tea at the Barn by the Willow tea rooms at Bury. One very notable feature of the days ride was the lush display of Bluebells in the many woods we rode by, many more than in recent years. Mileage from and back to Walberton was 43. My mileage from and back to Pagham was 62. The evening gave us absolutely superb cycling weather - brilliant sunshine, warm, and no breeze, so it was disappointing to see only Val and myself at the start point for tonights ride. Granted the destination did promise a few hills! On we went, crossing the A27 then taking the road past Mount Noddy for the easier climb to Eartham. Once at the pub we were joined by Edwin fresh from his 10 mile time trial. For the return trip, the 3 of us dropped down the hill to East Hampnett, narrowly avoiding a bat which homed in on Val and Edwin (no doubt attracted by their high powered front lights). Then we followed the A29 all the way into Bognor. Some smart running ensued on the surprisingly quiet road. More wildlife appeared as we entered Bognor with wild rabbits dining on the grass verges towards Felpham. We arrived back at Felpham only 45 minutes after leaving the pub, having completed a round trip of just over 21 miles. Today's forecast was again rain all day but we were again lucky with no rain and sunny spells early on, more cloud midday and clear blue skies at the end of the day. We said goodbye to Alan and Liz who had joined us for the Anniversary Dinner and were headed south by car to do some cycling in the Loire. We headed down the Avenue Verde Cyclepath. We turned off this at Bures-en Bray and then a long climb to the ridge above the valley at 700ft on quiet backroads. There then followed a long search for a V1 site Arthur knew of with some riding over the ridge and partway down and then back up on a another road. There were a few complaints from the ranks about going round in circles. 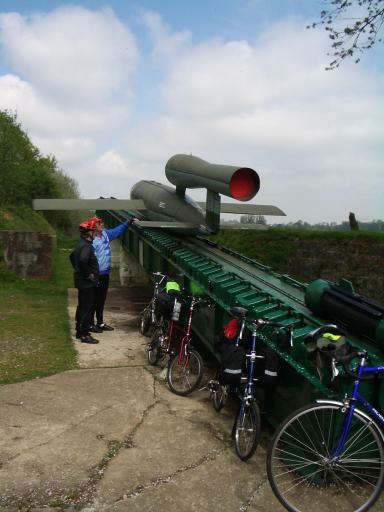 Eventually we reached the V1 launch site with a lot of buildings preserved and a real V1 preserved in situe. Then down to the Varenne valley and lunch in Bellencombre. Then down the valley taking in some minor roads one of which petered out in a footpath and a rickety footbridge over the river. We had one tea stop at Torcy and another at Peters house. Then on to Dieppe and supper by the Harbour before catching the 8.00 pm ferry back. 40 miles for the day. Exploring the V1 site in the hills near Ardouval. Today the forecast was heavy rain for later in the day. However we were very lucky with a lot of cloud but only a few spots midday. We left the Tourist Hotel and took a look round the big street market. Then on to a sports shop where Andrew bought a new badminton racket at a much cheaper price than back home. Due to lack of luggage space he carried this over his shoulder for the rest of the trip. Then on south and a stop at the big bikeshop we visited yesterday. Lynn purchased a Gillet like the one I purchased yesterday. I purchased some mitts and a long sleeved top. 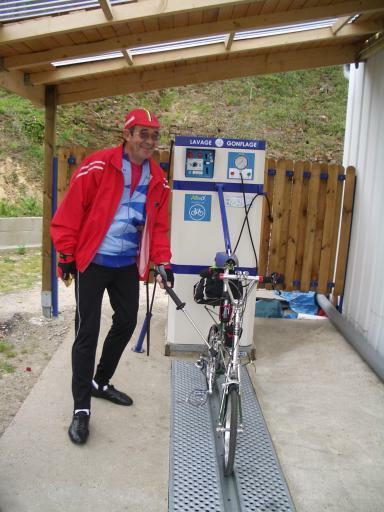 Then outside we found the piece de la resistance, a real genuine Bicycle Wash!! See picture below. Soon after the group split. 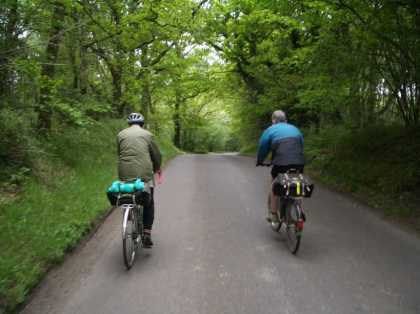 Arthur led Lynn, Andrew and Mervyn down the Avenue Verde Cycleway. 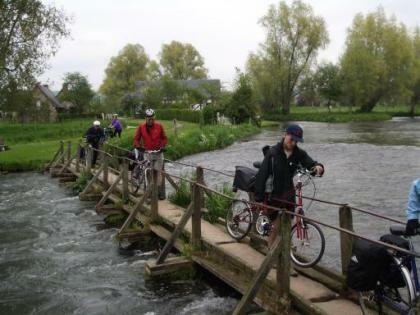 I led Mike, Avryl and Peter along a minor road alongside the Varenne river. We stopped for elevenses at Torcy. Then on to St. Saens for lunch. In the afternoon we took a very minor road up a steep climb through the Foret de Bully to 700ft. 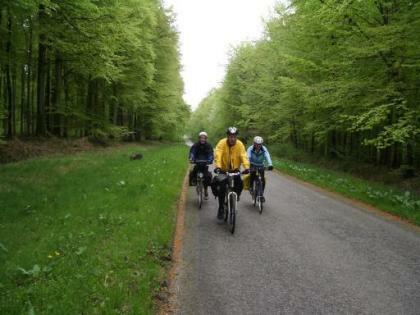 Then a ride through the lush forest on a plateau before a long descent to Neufchatel. 33 miles for the day. Friday 5 May. French Trip. We met up at Newhaven for the 8.00 am sailing to Dieppe. Myself, Mike who gave me a lift over, Arthur, Lynn and Andrew, Mervyn Cook a friend of Arthur's and Peter Wilson. Checkin was very slow and a long queue developed. We compared the widely different prices paid for the tickets from 13 pounds bought direct to 50 pounds through one agent. 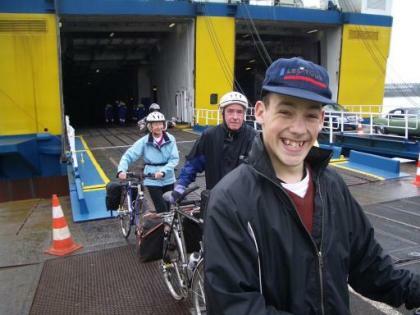 The 4 hour crossing passed slowly but we eventually arrived at 1.30 French time. We then had a 10 mile bike ride during which we managed 3 stops. 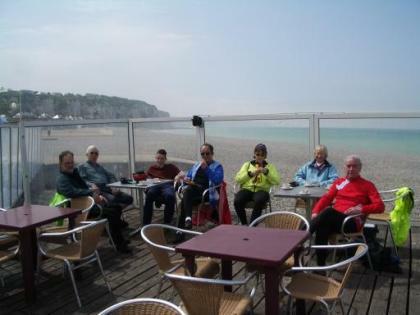 The first cafe was found on the seafront after 2 miles where we had coffee and hot chocolate in the warm sunshine. Then Peter invited us to visit his French home on the southern edge of Dieppe. This has a great location with a quiet garden where Peter served a choice of wine or Apple juice. On the way back from Peters towards Dieppe we stopped to browse a very good bike shop. Back in Dieppe centre our final cafe stop was adjoining the harbour with bowls of chips to keep us going until dinner.